sick – Definitely Not The Walton's…. Given that it happened late on a Friday and from past experience of the difficulties this causes, I didn’t bother to contact anyone medical until yesterday. But I got sneaky this time and bypassed the ward, going direct to G’s pediatrician. Recent visits to replace the NJ tube have been traumatic and getting more so each time. G has borne this bravely but enough is enough. The last experience left us all traumatised. I don’t use that word lightly but given the radiologist said we were going to have to abandon the placement due to the levels of distress and G effectively withdrawing consent, I knew we needed an alternative approach. I have asked in the past about some kind of amnesic inducing drug or light sedation and been berated for wanting to “drug” my child. However, the medical bods eschewing this approach only see a snap shot of my child for about an hour and usually aren’t in the room when the procedure is being carried out. Nor do they deal with the longer term fall out, the increasing hysterical approach to anything medical, the begging, pleading and promises he will be good, eat more, try harder; listening to this I defy anyone without a heart of stone not to be affected and I feel huge guilt. How do I reinforce this isn’t his fault?! At CAMHS appointments I listen as my child pours out his feelings of helplessness in the face of such procedures, his loss of rights over his own body and the feelings that he is not being listened to or even heard. And I question if it is right that he is put through this but we are left with little choice until a long-term solution is found. The radiology department are giving me increasing (well-intentioned) grief about the risks of his repeated exposures to radiation. I am told that each time they have to replace the tube in this manner it is the equivalent of undergoing a CAT scan in radiological terms. I have lost count of how many times the tube has had to be passed since it first went in in May and with no end game in sight, I am mindful we are potentially creating a different set of problems. So I threw myself on the mercy of our wonderful pediatrician, pleaded our case and to my immense relief, he immediately agreed and to save me having to battle and negotiate, liaised with the ward directly so that all we had to do was show up in the right place at the right time. There was the occasional raised eye-brow from a clinician TRIPLE CHECKING I definitely wanted to ‘DRUG’ my child but I think the steely stare and unwavering gaze assured her I wasn’t going to be persuaded otherwise and from there on out, G was treated with the utmost care and consideration and after the usual shenanigans of weighing, measuring, a gazillion questions, signing of consent forms, he was popped on a monitor, given the maximum dose of meds and was soon off his face, happily rambling utter nonsense. Truth told it was quite entertaining listening to his diatribe; apparently he was flying himself down the corridor, nothing to do with the trolley, porter, myself or the F1 accompanying! If it hadn’t been for his reaction to the taste of the medication, (lots of spitting and cries of DISGUSTING) I might have tried a cheeky request for some myself. I’ll spare you the ins and outs but it was so much easier and kinder to have the tube passed this time round. The best way I can describe the procedure is like watching someone rod the drains. My apologies to all medical people and specifically the radiologist concerned who no doubt trained and worked exceptionally hard for many years. To compare his skill and expertise to dyno-rod seems rather unfair and very dismissive!! But there is a lot of see-sawing of flexible tubes and guide wires, pushing, prodding, twisting and turning till eventually the sucker ends up in the right place! One hour later procedure complete, G still high as a kite, we were able to go back to the ward and let him sleep it off! He rambled and raved like a caricature of a Hollywood movie ‘drunk tank’ extra but he was funny and (mainly) charming and most importantly didn’t remember a thing when he eventually came round and found his tube safely back in situ. I count that as a definite win! Of course it would have been nice to be able to contact loved ones and let them know all was well but my phone and internet seemed to be playing up. I had received a mysterious text telling me I needed to make a payment to our phone provider and reacted with dismissal knowing that Mr DNTW’s has every thing set up on a brilliant contract where we get oodles of data, texts, unlimited calls etc. I assumed it was just my phone (or me!) playing silly beggars. But when eldest son contacted me on messenger saying he couldn’t call or text and could only use the internet when on wi-fi, I knew there was more to it. Still I assumed the network was probably down. Several hours later, when his nibs was back in Blighty, he messaged me to ask if there was a problem with my phone and that’s when began to wonder if there might be a little more to it…. Child number 2, J, has been home for the last week. He’s our fabulously witty, dead-pan humoured, technology wiz with a knack for circumventing every manner of parental security and or block we have ever put in place. He has what was called aspergers but now changed to high functioning autism (don’t get me started). I tentatively mentioned the issues we were having and his face changed…. £448 worth of bill later, we know what the problem was/is!!! Suffice to say J was mortified and Mr DNTW’s after a few ‘effs and jeffs” spoke to our mobile provider, explained what had happened and we are extremely grateful to their management team who were so understanding and agreed to refund the excess charges. Big up EE! So despite having left the house by 8am, not getting back till 3:45pm and feeling pretty drained all round, I felt the need for comfort food. Despite the fact that current air temp even “oop north” is on a par with the surface of the sun, I decided we needed a family roast with all the trimmings. A large portion of roast potatoes, chicken, lashings of gravy, Yorkshire puddings and veggies later my sense of equanimity is restored! This is a post I didn’t think I’d write for many years to come. One I shouldn’t even be thinking of composing. It’s not right. It’s not fair but here it is. 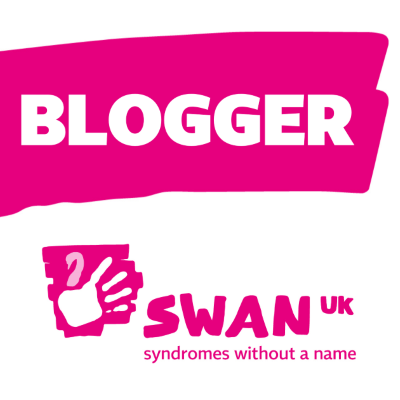 If you have read any of my past blogs, you will know some of the difficulties and battles our family has faced over the last few years. Whilst it’s not a competition, no top-trumps fest, the day to day demands of medically complex children, the amazing quirks but also relentlessness of autism, endless appointments, clinics, surgeries, battles for and with various agencies and services takes its toll. You Buddy (or Sir Budston of Burnarrrr as we sometimes referred to you!) my wonderful little dog, helped alleviate some of those burdens. Please don’t misunderstand me. I recognise there are many people, probably some of them reading this, who would give everything they have and then some to be facing those same fights and difficulties I mentioned, having lost their precious loved ones far too prematurely; but oh my boy, I thought we had so many long and happy years ahead; wondrous walks to stroll/pad through, delightful or disgusting (depending on your perspective) smells to sniff and cuddles on the sofa to sneak in at any and every opportunity. Buddy, much admired by all who met you, faithful four legged companion. How can we only have celebrated your birthday a month ago? How can it be that we never even made it to a whole year of you being in our lives, in our home? You were my birthday present almost one year ago. We had talked about having a dog for over 5 years before taking the plunge. A bit like having a child, it was never quite the right time to introduce a dog to our chaotic lives. Enlarging the family, moving house, redundancies, working abroad, relocating and leaving the island of my birth and the only home our children had ever known followed by house rentals before finally having a settled(ish) house of our own. Quite out of the blue and having been a steadfast, most resistant party, I’ll never forget the day my hubby, Martin, turned to me and asked if I wanted a puppy for my birthday! Minx was about to go into theatre for surgery number whatever and was giggling woozily from the pre-op medication. I recall being so taken aback I asked him if he had actually downed the pre-med instead! I was ecstatic and not about to give him time to change his mind. Although it had been a long time coming, I knew exactly what kind of dog would suit our family, our crazy-hectic-bonkers lives and had done quite a bit of research in the hope that one day… maybe…just maybe… we would be lucky enough to have a pooch of our own. We saw your picture first and a flurry of emails were exchanged before THE BIG DAY: your homecoming; my 40 something birthday. The moment I picked you up, cuddled you to me and laughed at the thought of putting you in the enormous crate in the back of the car, you filled our hearts so entirely. The void you leave behind is a chasm of epic proportions. I don’t know how or if ever it can be filled. It doesn’t seem possible that I’m writing about your passing over the rainbow bridge when we should be looking forward to so many more years of mischief and mayhem. More days fretting about what you might have managed to scarf down if one of us wasn’t quick enough to stop you – I lost count the amount of Lego I scooped up just in time; how many bits of this and that I retrieved from your doggy jaws. Your quivering nose whiffling along always seeking out, questing and foraging. You could smell a dropped blueberry from a 100 paces and hear the rustling of the treats bag in the kitchen no matter where you were in the house or garden; a pretty useful tactic when you were being cheeky and not wanting to come to us when called! You brought so much happiness. Joy, laughter, giggles and fun. And so much poop too! Martin tells me he cleaned up 12 doggy bags worth yesterday. Considering I last did it on Saturday morning and yesterday was only Wednesday, that’s quite an achievement. Especially since you were nil by mouth from Monday night on. And you were at the vets all day Tuesday…. A lot of expectation on such stumpy little legs. Not just the 6 people in your immediate family cuddling you, loving, and petting you. So many people that had the pleasure to meet you – our favourite coffee shop by the river and all the employees therein, our lovely groomer and her dog Poppy, friends and family and the seemingly never ending stream of delivery people with medical supplies or equipment, Amazon deliveries and so forth. Always an action packed day in this wonky-old household and you always ready to greet them with a deep woof, occasional bark and a wave of your magnificent plume of a tail. We often remarked your tail was bigger than you! It looked like it should sit in pride of place on a hat worn by one of the 3 Muskateers. And now I have a small piece of it saved in a memory box to remember you by. It smells still of the grooming, pamper session you had just last Friday. I’m glad it is of that and not the clinical smells of the veterinary practice, their kindness not withstanding. Your grooming sessions over the year cost more than my haircuts! You were my secret keeper extraordinaire. Too many nights I muttered oaths into the top of your sweetly curling fur when dealing with the latest co*k-up from various services, be they special needs, medical bods or utility companies. So many times I poured out my heart and soul to you, you listening attentively with your head on one side, adopting the classic cava tilt that all other cavachon owners will recognise in its uniqueness. When I was saddest you snuggled that bit closer. When I was happy you were delighted that there were extra treats and cuddles and when it was all just a bit too much, you expected nothing but ensured your presence was always felt. We joked often that you were not so much a dog – more part goat, part sloth. Your dislike of vigorous, brisk walks was the cause of much frivolity and it was remarked upon more than once that you were the perfect companion for a fair-weather not terribly exercise motivated owner such as myself. Too many times at the site of your harness and lead you would feign sleep or rush back to your bed refusing to come out, especially if it was cold. and dark. and raining. and there was a ‘Y’ in the day…..
Of course now I know my darling boy, you weren’t just faking it; you weren’t trying to make me feel better about the dislike of walking in the 4-seasons-in-1-day climate of Yorkshire. You were tired. Your little body was constantly battling a build up of toxins that in the end would be your downfall. I try to take comfort from the fact that you are no longer suffering. That we could afford you the peace and dignity that is so often missing when our human loved ones are terminally ill. It makes a small dint in my grief. At the moment there is too much sadness in this household. Too many reminders everywhere we look: your water bowl empty, toy box neat and tidy, not strewn all over the kitchen. Your place on the sofa vacant. I think even Tilly the Cat in her own feline way misses you; after all she can no longer take a swift munch out of your breakfast or dinner when she thinks none of us are looking. Secondly, who in their right (or wrong, very wrong) mind could even think of 50 separate ways to clean up puke (don’t flood me with ideas, I really DON’T want to know) unless you are some weirdo with a peccadillo for emesis (posh word for barf doncha know). If you fall into the latter category and have a predilection for all things vomit relating/inducing, I can’t decide whether you should move in next door to me so I can call on you in times of desperate need or whether I would like you to remove yourself from my blog readers 😉 I’ll ponder this further after a very strong coffee to reconstitute myself after this morning’s endeavours which as you may have succinctly deduced involved clearing up the outpourings of a poorly G Man. Despite being the mother of 4 children, the oldest of whom is now 17 and started out his life as a prolific refluxer plus various nauseous pets over the years, I am spectacularly bad when it comes to the whole shenanigans associated with dealing with THAT bodily function – see I have to carefully allude to the literally stomach churning matter since even discussing it starts to make me feel more than a little queasy. The journey to school aged 9 when my brother and youngest cousin were playing some game in the back of the car involving bogies which prompted my brother to be sick all over my cousin, my cousin was then sick all over me and my dear Dad (he of the famed “what goes on in the car stays in the car” quip) instructed yours truly to clean everyone up!! This made me sick which then made Dad sick… you get the picture!! There was the flight home post an amazing sun-baked, cake and booze fuelled relaxing holiday in Eilat with hubby, kids and my parents when my eldest, then aged 10 and Minx, 14 months, were unwell (an understatement!) Poor H perforated an ear drum mid-flight and the pain made him upchuck prolifically, all over yours truly and Minx unable to swallow her saliva, having difficulties with increased secretions and oxygen saturations because of the reduced air supply eventually managed to bring everything up all over me. That particular trip culminated in being met by an ambulance airside at Luton and being transferred with 2 poorly children to the local hospital clad in linen trousers, wispy thin short-sleeved blouse and flip-flops covered in the UNMENTIONABLE from head to foot. I had managed to grab our passports but no handbag or warm clothing so coming back from 30+ degrees heat to a miserable late night in Blighty in single figures temperature wise was never going to work out well anyway but quite how I persuaded the poor gentleman in the taxi to take us to our hotel once the kids had received appropriate treatment, medications etc, sporting ‘eau de vom remains one of the great mysteries of the world…. Then there was a Christmas Eve morning that still makes me shudder: Martin had been at work on an early shift but was due home mid-morning. Imbued with the festive spirit, (and I don’t mean having drunk it!) 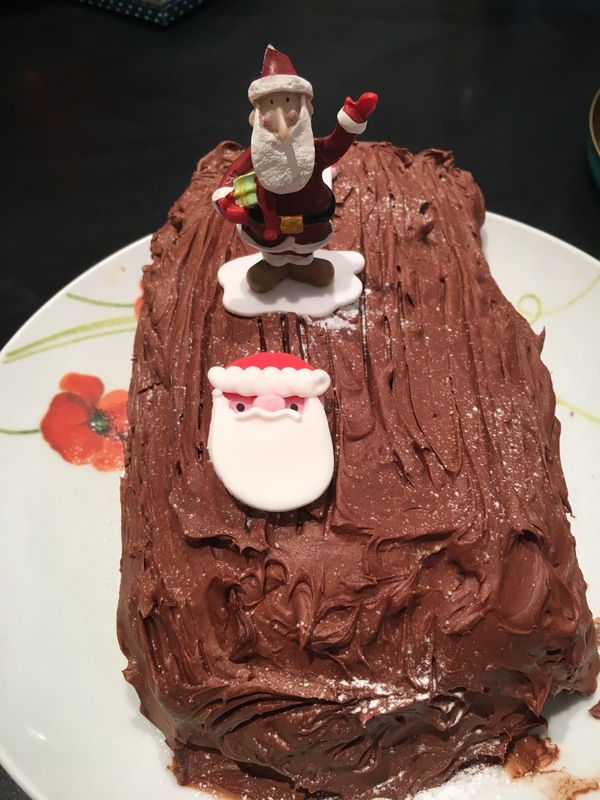 I decided to make a Bouche Noel (fancy way of saying chocolate Yule log) as a last-minute dessert. All 4 kids were occupied, seemingly playing nicely (probably should have foreseen that as a clue!) so when hubby called me to say he had landed and was off to pick up his Mum, did they need to come straight home or could they pop to the shops, I gave a tinkly little laugh and assured him that all was under control. Oh how that would come back to bite me on the bum…. Festive songs on the radio, fridge fit to bursting, I set about with the flour, sugar, eggs & whisk… Shortly after I had prepped the mixture on to grease proof paper ready to pop in the oven, feeling smugly all Nigella, the shrill, panic-stricken tones of G Man yelling “Mummmmmmeeeeeyyyy” shattered my ear drums from 2 floors above. All parents recognise the particular siren call that indicates real TROUBLE and possibly DANGER so I high-tailed it up the 2 flights of stairs half expecting to find a severed limb or child dangling from the ceiling light and whilst my initial reaction was relief that this wasn’t in fact the case, it very quickly turned to revulsion and then to despair when I realised Martin wouldn’t be home for some time to assist. A bit of context: Minx being strong-willed had decided in the October of that year, before she was 2, that nappies were a no-no and with an early glimpse of the determination that has gone on to be both a blessing and a curse, set about the valiant efforts of toilet training herself (and with my reluctant support) with remarkable aplomb. So on this fateful Christmas Eve, G-Man being ever helpful and adoring of his little sister had ‘helpfully’ brought her Peppa Pig potty in to his bedroom on the top floor of the house where they were playing with Lego. Whilst I’m sure most of us would agree that our own poop doesn’t exactly smell of roses, it should be noted that Minx was taking numerous medications, several of which meant she emitted an especially noxious odour in matters of toileting. Thus it was, eyes watering, ears ringing and nose almost bleeding, I greeted a truly horrific scene: Minx still astride her throne, 4 pieces x 2 squares of toilet paper that G had thoughtfully laid out in front of her. G sitting atop his cabin bed, Lego scattered far and wide… and copious amounts of vomitus. But to add to the awfulness, G having retched at the potty odour from on high had proceeded to be sick all down the side of his cabin bed, on the Lego… and worse still, atop Amelia’s head!! 😫😫 She then & I guess understandably in the circumstances, had also let loose. By this point, the combination of aromas in that room were making ME gag. I threw open the velux windows as wide as they could possibly go & screeched at the elder 2 to avail me of plastic bags, buckets, disinfectant, paper towels and baby wipes STAT!! When they arrived duly laden, they also began to heave. Major flaw in my plan so yelling afresh, I got them to leave the immediate vicinity of hell and set to work cleaning up. If you’ve never experienced the heinous task of gathering up vast amounts of sharp, multi-coloured pieces of plastic of varying sizes and shapes covered in vomitis (and why would you?!) let me be the first to tell you it proposes a logistical nightmare. How to scoop, run and get to sink without creating further devastation?? If I didn’t have the littlies to bear witness, I would have cheerfully disposed of the lot in bin bags, nary a thought of the cost of those pesky bricks (and to be honest after 4 kids we had enough Lego between them to construct our very own Lego land anyway!!) but their beady eyes were following my every move and frankly I couldn’t face the thought of adding crying and snotty tears to the already over crowded bodily fluids in that room so I (ahem) sucked it up (not literally!!) and used a bath towel to traverse back and forth to the bathroom until the vile task was done. Of course it wasn’t over then because I still had kids, floor, bedding etc to clear up. And so it was that Martin returned home some hour or so later to find me lying on the floor alternately sobbing and swinging from the cooking sherry, muttering dementedly. Even 6 years on, that has to be up there as one of the nastiest events of my life! Pay someone else to deal with it. Extravagant? Undoubtedly but worth every penny if you are phobic. Napalm – if in doubt and with no willing helper/employee annihilate the fall out zone… NB best to evacuate anyone nearby, (even if you don’t get on with the neighbours) check your home insurance policy wording first and see what your mortgage lenders T’s & C’s are if you have one. Give your house away/to charity.…less likely to be fussy/complain and more willing to clean up. IGNORE, DENY EXISTENCE, CLOSE DOOR, ACT SURPRISED, upon discovery with a n other present then revert to point 1…. If all else fails and you really have to do the clean up, arm yourself with gloves (plastic/rubber/latex NOT woolly!) plastic bags, kitchen towel, baby wipes, antibacterial spray, pet soiling clean up spray (it breaks down the enzymes and gets rid of that lingering sick smell that’s so difficult to get rid of) and mentholated vapour rub (e.g. Vicks/Karvol or similar) and smear liberally under your nose, septum and philtrum (medical jargon for the bit between your nose and top lip!) I decided to try that little tip after reading a book about how bad dead bodies that have been in water smell and the pragmatist of the story attending a post mortem using Anyway, I digress… Throw windows open as wide as you can for added ventilation (assuming there are windows) and leave the top off the mentholated vapour rub for emergency sniffing if it all gets a bit much. If you happen to have a room spray of some description, give the room a good blasting – even LYNX does the trick although I’m not sure that’s what the manufacturer intended it for 🤔 Once you have removed the worst of the offensive matter, carpet cleaner, preferably in the form of a dedicated machine rather than something you spray or sprinkle on is your friend. It’s funny how sometimes an idea for a new post comes upon you…this one came to me as I was cleaning up after one of my littlies had been sick. (thank you reflux) and therefore I am sure Dear Reader, you are just dying to read on aren’t you?! So THE RULES…..Hubby and I have a very old fashioned, what used to be termed traditional marriage, especially now that he is the sole bread winner (to be fair, with me, 4 kids and 2 cats, he’s more like the crumbs winner than the whole actual loaf but I digress) since I gave up a “proper” job 2 years ago to be the main carer for our children. Any feminists might want to stop reading further since I am sure I will be inundated with outraged responses that I am setting women’s lib back 50 years at least. However, personally, I think the whole women’s lib thing might just have shot us well and truly in the foot and not just because I actually do like wearing high-heels and don’t consider them some enslaving device of patriarchal oppression. Woman these days are expected to want it all, have it all and be it all but at the expense of what? Having been both a working Mum and a “non working” one, I don’t pretend to have the answer as to what is best for anyone else but in our family, it was glaringly obvious that something had to give and it was going to be my sanity if I carried on working in regular employment and juggling hubbies shifts, child care, medical situations and the like, especially when he went to work away and I was left being Mum and Dad as it were. Some woman manage it all with aplomb; I am more than slightly envious of those sleekly put together, glossy haired, designer-handbag toting women who waft calm, serenity and Jo Malone and seem to have both their immaculate, perfectly behaved small folk and board room big wigs eating out of their hands. They also somehow manage to sit on the PTA, have organic, paraben free nic-nacs everywhere and do a Nigella in their kitchen. (Actually, I have often wondered if those women are not some visiting alien/stepford wife experiment, judging by the amount of amazing yet frazzled women I meet in the “real” world). I doff my hat to you, however, I can’t and I’m not too proud to admit when I’m beaten. Maybe it’s the sheer number of kids we have or the fact that 3 out of the 4 have extra needs; maybe it’s having a hubby who works shifts and for which weekends off are rarer than rocking horse poo. All I know is that whilst the extra money I earned was very welcome, it ultimately was a case of boom or bust in more ways than one and with only a slight reservation I handed my notice in to concentrate on events on the home front. Since taking on the mantle of full time motherhood/carer, we have fallen into largely traditional roles: he takes the bins out and mows the lawn, checks the tire pressures and that sort of thing and I am responsible for keeping the home fires burning and all that entails. Anyway, back to the focus of this post: RULES. Being a virtuoso parent of some 15 1/2 years I have dealt with my fair share of dirt, snot, pee, poop and blood and I am generally a hardened veteran on these fronts. However, there is a point I well and truly draw the line at and it was established very early on in to the days of parenthood: VOMIT (I’m getting to the point of the post soon I promise). Give me a small child saying “here Mummy!” and thrusting a revolting, crusty bogey in my hand, I barely bat an eyelid; wee that’s flooded every where but the toilet bowl – well I have 3 boys (4 if you count the hubby), I can whisk out a wipe quicker than you can say Cillit Bang. But PUKE…nope, not ever, not even slightly. I am vomit phobic; in fact, this is actually a pucker phenomenon and goes by the time of emetophobia. I’ll be honest, even talking (writing) about it gets to me. Pre children, I really wondered how I would cope with this aspect of child-rearing and it did make me question whether I was cut out for motherhood at all. (There have since been many others aspects that have me questioning that but it’s a bit too late 4 children on 😉 ) I however reasoned that vomiting kiddos was not an every day occurrence and was prepared to take the plunge. I didn’t of course factor in refluxing children (3 out of my 4 little treasures have had major reflux issues and didn’t grow out of it until an advanced age in the case of the oldest and the little 2 still suffer regularly despite meds, surgery etc) who could do an impressive performance that would rival something from The Omen and cover walls a spectacular 8 feet or so from me, even managing to hit the ceiling on various occasions. Baby vomit from milk was manageable but only just. Add in food and it’s a whole different kettle of fish. Hubby can still regale you with the tale of when we were away with our firstborn. 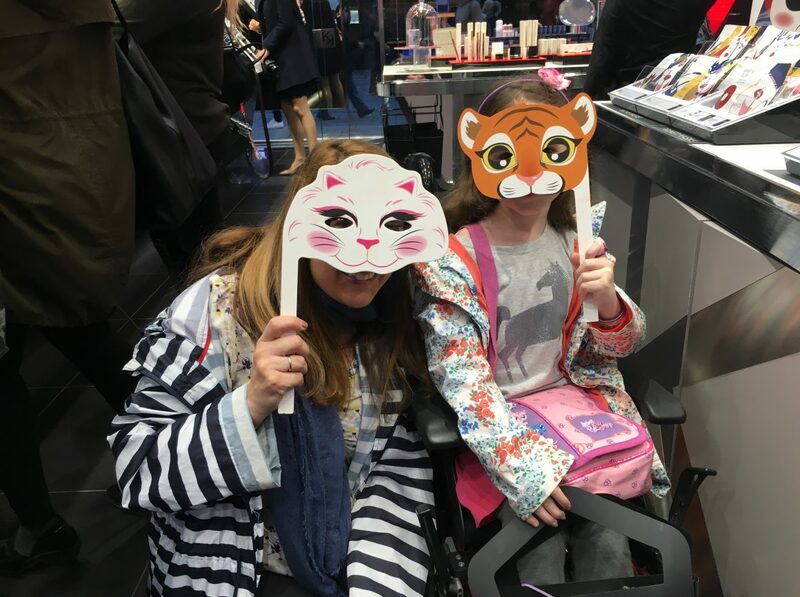 He had been suffering from a truly horrible ear/throat infection and having been off his food for a while, managed to consume most of a jar of food in Boots, Brent Cross and then techni-colour yawned prolifically all over the baby change facilities. When I started making that harrumphing noise, eyes streaming and ashen in the face, I was despatched unceremoniously into the shop to find clean clothes and purchase enough baby wipes to reach the moon and back. Apparently he was not prepared to clean up me too. Very unreasonable I thought. So early on in our parenting roles, it was established and agreed that Martin would be responsible for clearing up vom-related incidences. In hind-sight and if I had my time again, I would have had it written in as an actual clause to the marriage vows and every employment contract he ever signed. Actually not a bad plan going forward…. Since the vomiting incident that inspired this blog post transpired at 5:30am one Saturday morning and hubby was of course at work, I was most put out. Being roused from slumber to the less than welcome tones of “I AM FINISHED” (bottom wiping) is bad enough but vomit is a whole new level of no no. Upon proffering a glass of water, cuddles and reassurance to the G man responsible for the “deposit” in his bedroom, it briefly (not that briefly) occurred to me to just shut the door on it and leave it, especially as G sleeps in a cabin bed and had produced his offering all down the side of it, on to a pile of lego and clothing as well as the sheets and carpet. 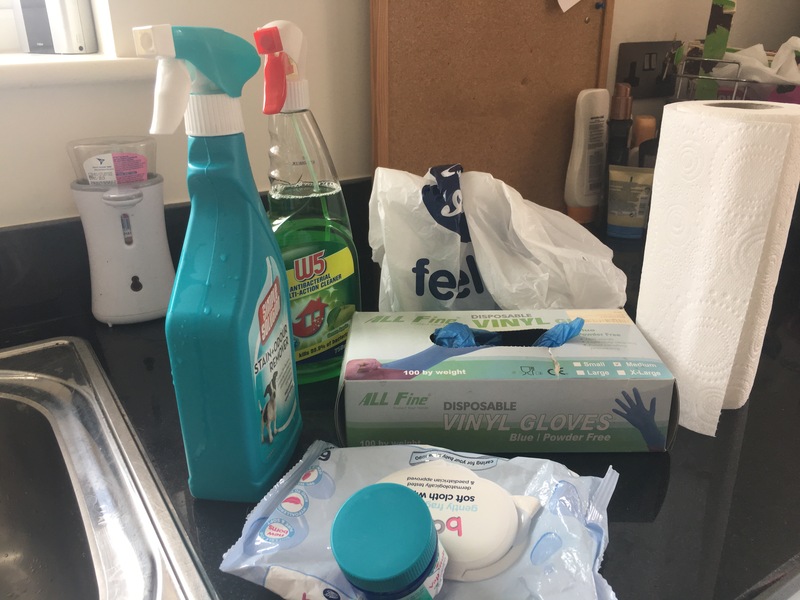 My befuddled, sleep fogged brain tried to calculate how long it was until hubby’s return but maths has never been my strong suit even under the best circumstances and so I gave up even trying to guess and resigned myself to a date with the rubber gloves, dettol, bucket and kitchen towel. One amazing tip I have discovered is that Vicks Vapour rub smeared prolifically under one’s nose is nothing less than a god-send when having to tackle this hideous task. I think I was inspired to try it by an episode of Silent Witness or similar when they had a “floater” – dead body that has been in water for some time – to autopsy (FYI, floater means something entirely different in this house). Whilst it doesn’t stop my own stomach trying to add to the mess, I can usually manage to dry retch my way through the clean up. Try it next time you are faced with such a situation…or leave it to your other half….definitely my preferred option. THOU SHALT NOT GO TO WORK/PLAY/CYCLE/ AND LEAVE THOU’S WIFE TO CLEAN UP THY CHILDREN’S VOMIT UNDER ANY CIRCUMSTANCES….EVER…EVEN IF THAT MEANS DELAYING YOUR WORKING DAY/PLAY TIME. Funnily enough I can’t seem to get him to sign it……ah well, off to google “an idiot’s guide to legal contracts” and see if I can find a loop hole…..